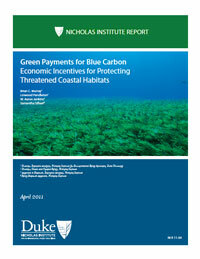 This report examines the critical question of whether monetary payments for blue carbon—carbon captured and stored by coastal marine and wetland ecosystems—can alter economic incentives to favor protection of coastal habitats such as mangroves, seagrass meadows, and salt marshes. This idea is analogous to payments for REDD+ (reduced emissions from deforestation and degradation), an instrument of global climate policy that aims to curtail forest clearing, especially in the tropics. Like payments for REDD+, incentives to retain rather than emit blue carbon would preserve biodiversity as well as a variety of other ecosystem services at local and regional scales.